At first I listened with my eyes, then I learned to see without seeing, with blindness there are only two things, your hands and your ears. 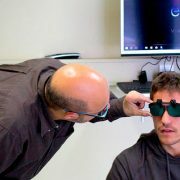 The first time I heard about Eyesynth was through a colleague from ONCE, and I immediately wanted to know what it was. So I got in touch with Antonio Quesada, and from the first moment I wanted to be part of this project. I did an apprenticeship with Antonio Quesada and Daniel Fuertes, it was a very amusing virtual reality, and it was surprising to me how they had conceived it, it was like the dynamics of a children’s game with advanced technology. I have internalized the rumor that you hear every time your eyes look at an object or an obstacle, “pssssssssssss” or “pppppppppps”, depending on the volume of the object, it was as if I was listening to the sea, but that rumor did not prevent me from continuing the conversation with Antonio or Dani, and that fascinated me, I could talk, move, and know what was in front of me. 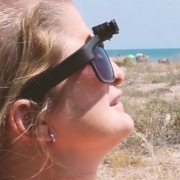 It was easy to get used to how the glasses work; I firmly believe that a person who is blind or has low vision can be given an autonomy that we did not have before. Can you imagine what it means for a blind man to be able to detect a table before he stumbles upon it? Or that the glass of water is right in that place? The more Antonio Quesada told me about all the innovations that could be added in the near future, the more I liked the idea. It was not something closed, but that could evolve and continue to improve. 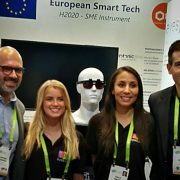 The Eyesynth team had an amazing experience at this year´s Consumer Electronics Show (CES) in Las Vegas. It was a tremendous honor to exhibit our technology at the largest and most prestigious technology trade fair in the world, especially considering the fact that our company is only two years old. First, we´d like to thank the European Commission Horizon2020 SME Instrument program for giving us the opportunity to participate in this year´s event as one of the 15 most innovative companies in Europe. We know how competitive the selection process was, which makes us even more grateful to have had this opportunity. The CES event ended up being almost a year-long process for Eyesynth, from the moment we submitted our application, to receiving the confirmation that we had been selected to attend, to attending conference calls with our counterparts to receive information about organization and booth logistics, to designing what our booth would look like, to renting the television necessary to perform our demo, to sending the additional material necessary for the demo and making sure it passed U.S. customs and made it to Las Vegas in time for the show, to renting an apartment and a vehicle, to traveling 26 hours with multiple stops to arrive in Las Vegas from Spain, and finally exhibiting our technology at the show. All in all it resulted in a breathtaking, intense, but most of all rewarding experience. What impacted me the most from our presence at CES was the amount of positive feedback and goodwill that we received from the hundreds of people who visited our booth to try our demo throughout the week. 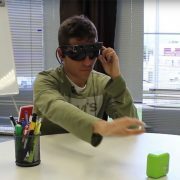 We believe at Eyesynth that we have a very strong product that can be a new mobility standard for the blind and visually impaired. It is a company imperative, however, to place the opinion of our users at the forefront of everything that we do. To that end, their input, as well as those of their carers, and other stakeholders such as ophthalmologists, is invaluable to us. 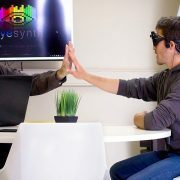 At CES, we received an incredible amount of positive feedback about the Eyesynth system. Words like ¨amazing ¨, ¨game changer¨, ¨revolutionary¨, or ¨the most interesting technology at CES¨ were descriptions that we heard often to describe our device. 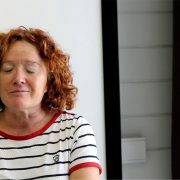 I know that for our team it´s very gratifying to hear words like these, as it reinforces our sense of purpose to improve the lives of the blind and visually impaired community. While the feedback received was what impacted me the most from the event, what made me the most proud was the effort and contributions of the entire Eyesynth team to make CES 2018 as successful as it turned out to be for us. I´d like to mention our CTO Alberto Fernandez and his team of engineers (Andres, Jose Carlos, Edy) that worked tirelessly before and during the event to make sure the system was running at peak performance for our demos, Dani Fuertes for helping out with everything from email list segmentation and mailings to packaging, Carpe Diem Communications for disseminating news about our presence at the event to the media, and of course Antonio Quesada who made everything come together. I´d also like to mention Kally Umana and Shariann Carlo, who worked with us as hostesses at our booth and acted like they were part of our company from day one. We have a truly committed, passionate team at Eyesynth that rose to the occasion to give its very best for this event. I tried to imagine how cameras located on top of the actual glasses frame could capture images and convert them into a sound that I could decipher and interpret, a sound very similar to the soft sound from the ocean… how a table or streetlight could have a distinctive sound corresponding to its shape and size, or what I would perceive when standing in front of a mirror after having lost my sight so many years ago…? The truth is that during this trip to Madrid with the Eyesynth team I had a very pleasant conversation with Antonio, who explained to me how the Eyesynth system works. I developed incredible curiosity as to whether my questions regarding the glasses would be addressed when putting them on. Within 15 minutes of wearing the Eyesynth glasses at a cafeteria close to the station, I understood for myself what Antonio had explained to me: the abstract sound, slightly moving (¨sweeping¨ left and right) my head so the cameras could detect the corners of an object, raising my head to detect its height… until finally differentiating a jug from a plate and extending my hand to pick it up without previous tactile recognition of the table, only by moving my head and listening to the sound! The brain is plastic, which means that it is capable of modifying its connections when learning new things. It´s incredible how something that I hadn´t been exposed to was so easy to understand; the distance between the objects, their height, and shape are details that I keep learning about the more I practice. Evidently, the glasses have not restored my sight (which the Eyesynth team keeps insisting on), but they suddenly expand my field of action and my abilities to feel my surrounding environment. I imagine many possibilities that I´m anxious to explore. There´s a video circulating on YouTube about one of the trials I did. It shows the first time I reached and grabbed an object in years. Without prior indications, without having touched it before. It was incredibly exciting. By the way, the mirror was quite an experience. I´ll tell you more about it in another post. Until then! Today Pablo has been able to test the new firmware version of the system. A much more refined version to which Pablo has quickly become aware of its benefits. Now the audio response is even more immediate and accurate. The system is capable of detecting and displaying pieces that are 2mm high on a table. Of course, it will take training to distinguish something so small, but it is possible. Pablo handles the system impeccably. New version, approved. We will keep working! Today with Pablo, our betatester, we have been doing ergonomics tests. The new design of the glasses is much lighter and more comfortable than the first prototypes. Even so, we are further refining the design in terms of comfort, materials, weight distribution … and also appearance. Soon we will publish images of the new designs as we get closer and closer to the final model for manufacture. 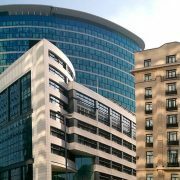 Today we are in Brussels, invited by the European Commission to the Welcome Day of the SME Instrument. We will meet other beneficiaries of the Horizon 2020 programme, and we hope to have some productive networking. In addition, we will present the project to the audience. Furthermore, we will meet in person with our Official, so the trip promises to be very interesting. Jorge Martinez and his family have come to visit us today. 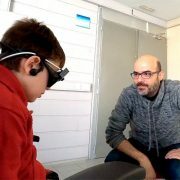 Jorge has been able to test the Eyesynth System, and he has helped us by giving feedback of his sensations. We must say that Jorge has performed fantastically. Many thanks, family! 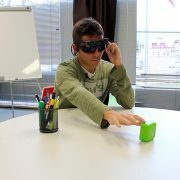 Today Pablo Cantero (Pablocanterolopez.com) has made his first test with the Eyesynth System. Pablo is our official beta-tester, and will help us develop the system. Welcome aboard, Pablo! 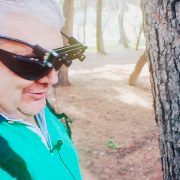 Today Miguel Benages (Director of the ONCE in Castellón) has been able to test the Eyesynth system in an open air environment, specifically in the Grao pine forest of Castellón. It’s our first outdoor test, and who better than Miguel to do it. The results have been great.